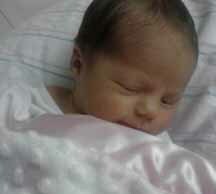 Alaina Celeste Barecky came into this world on June 10, 2010 and left this earth to be with the Lord on October 29, 2010. Her proud parents were Aaron and Ashley Barecky of Port Lavaca, Texas. The doctors early on detected some possible medical issues with baby Alaina but each of the specialist consulted had their own professional opinion of Alaina's prognosis. When sweet baby Alaina came into the world, her hydranecephaly (fluid on the brain) was much worse than the doctors had predicted. Alaina spent most of her days on this earth in the neonatal ICU at Driscoll Children's Hospital in Corpus Christi, Texas. With hospice care, she eventually went home with her mother and father. To say that the members of Outreach had a powerful influence on this family is an understatement. Outreach Church of Christ did not think twice about donating money to help this precious couple with the overwhelming costs of gas, meals, lodging and other miscellaneous expenses. The prayers and heart felt sentiments from Outreach impacted this young couple more than words can express. I continually heard Aaron, Ashley, family and friends talk about the generosity of Uncle Dales and Aunt Jenny's church in Hamilton. They were amazed that a small church in central Texas was so willing to assist them in their time of need especially since you did not even know them. Through all the trials and heartache of losing their first born child, this God loving couple kept their faith. It was this faith and all the prayers and support that kept them going. Dale and I want to take this opportunity to thank all of our brothers and sisters in Christ at Outreach church. We are so proud to be a part of this church family. Never doubt the influence you have on others. Your love for the Lord and willingness to serve is far reaching. Just ask a certain young couple from south Texas.